A couple of years ago my mom made a delicious cheese ball that had a few different kinds of cheese in it with bacon bits and I’m pretty sure I ate the entire thing. I’ve thought about asking her for the recipe but I’m pretty sure that I’d gain a few pounds by eating nothing but cheese ball for an entire week. As you may have seen from some of the last few posts on Moms & Munchkins, I’m on a roll here with quick & easy Christmas snack ideas. Today I made a little snack pack for kids that includes a DIY mini snowman cheese ball. If you have a delicious cheese ball recipe, you can start with that. For the quick & easy way, I used herb & garlic cream cheese for the cheese ball portion. Simply take a little scoop and form it into a ball with your hands. In your child’s DIY snack pack you can also add in some mini triangle shaped carrot sticks for a nose, a few black sprinkles for eyes, mouth and buttons (sliced black olives would work too but I don’t think you’ll find many kids who like black olives), pretzel sticks for arms and some long rectangle crackers (call these toboggans) for spreading the cheese onto as a snack. Another idea I thought of after I took the picture was to add a cheese string that kids could use as a little scarf on their snowman. 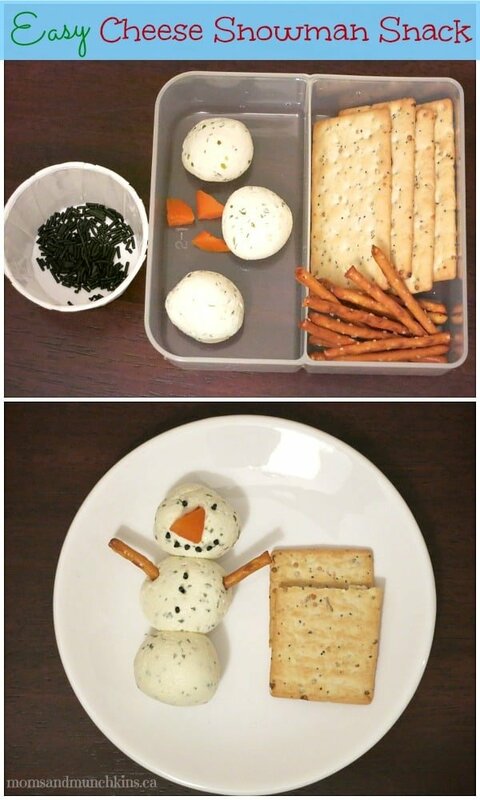 Kids can then use their little DIY snack pack to make their own mini snowman cheese balls. For more fun Christmas ideas like free printable games, party ideas, snacks and more, visit our Christmas Fun page. We’re adding new ideas all of time so follow along on Facebook, Twitter, Pinterest and Bloglovin’ for the latest updates.